I. An ancient kingdom of Spain, in Andalusia, now comprising the three modern provinces of Malaga, Granada, and Alme-ria, bounded S. and E. by the Mediterranean; greatest length about 200 m., greatest breadth about 80 m.; area, 11,063 sq. m. The surface is diversified, with lofty mountains, beautiful valleys, and extensive plains. The Sierra Nevada mountains traverse the territory from E. to W.; their summits are crowned with perpetual snow, and one of them, the Cerro de Mulhacen, attains an elevation of 11,654 ft. above the sea, and is the highest mountain in Spain. The only railway of the province connects the city of Granada with Antequera and the railway from Malaga to Cordova. The principal rivers are the Jenil, the Almanzora, and the Guadalorze. The climate of the mountain districts is cold, that of the plains temperate, and that of the valleys sultry and unhealthy, especially during the prevalence of the wind called solano, which blows periodically from the Mediterranean. The soil is barren or fertile in proportion to the possibility of irrigating it from the mountain streams. Agriculture is the chief business. The principal manufacture is silk. The wine is generally inferior, but the tierno, muscatel, and Malaga are exceptions, and have a high reputation. The sugar cane grown in the neighborhood of Velez Malaga is deemed fully equal to that of the West Indies for size and juiciness. The foreign trade is not important, and is chiefly carried on through the ports of Almeria and Malaga. This province formed an opulent, civilized, and powerful kingdom under a Moorish dynasty founded in 1238, which was overthrown by Ferdinand the Catholic in 1492. II. A modern province, bounded N. by Cordova, Jaen, and Albacete, E. and S. by Almeria and the Mediterranean, S. W. by Malaga, and N. W. by Cordova; area, 4,937 sq. m.; pop. in 1870 estimated at 485,000. It is almost entirely mountainous, the only large tract of level country within its boundaries being the Vega or plain of Granada, on the Jenil, between the capital and Loja. III. A city, the capital of the province and kingdom, on two declivities of the Sierra Nevada and on the plain between them, 34 m. from the Mediterranean, and 224 m. S. of Madrid; lat. 37° 13' N., Ion. 3° 40' W.; pop. about 68,000. The river Darro flows through it, and falls into the Jenil just outside the walls. The site of the city is about 2,000 ft. above the sea, and its appearance from a distance is singularly picturesque and beautiful. It is divided into the city proper, the Alhambra suburb, the Albaycin suburb, and the Antequeruela suburb. The first three are partially fortified, but the fourth is entirely open, and here the working classes generally reside. The streets are narrow and crooked, but the houses are well built in antique oriental style. There are several handsome squares and numerous public fountains. But the public edifices and the monuments of its former splendor are the great attractions of Granada, and first among these must be ranked the Alhambra, or ancient palace of the Moorish kings. 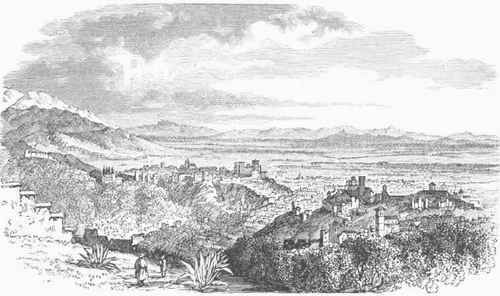 (See Alhambra.) The Gothic cathedral is profusely ornamented with jasper and colored marble, and surmounted with a dome resting on 12 arches, beneath which stands the gorgeously decorated altar. The church of Nuestra Senora de las Angustias is remarkable for its altar and towers; the church of San Jose, a modern structure, for its elegance. The monastery of San Geronimo contains the tomb of its founder, Gonsalvo de Cordova; but his bones were dug up and cast out by a mob who plundered the convent in 1836. Granada contains the unfinished palace of Charles V., the Generalife, a Moorish palace surrounded with gardens and fountains, an episcopal palace, a university, and a general hospital, as well as many conventual establishments for both sexes. The chief manufactures are silk, woollen stuffs, hats, paper, saltpetre, and gunpowder. The trade is insignificant, and the roads leading to the city are so wretched that in the rainy season they are almost impassable. Granada was founded by the Moors in the 10th century, and from 1238 was the capital of the kingdom of Granada till its subversion in 1492, when it was taken by Ferdinand and Isabella after a protracted siege. It prospered for another century, but when the Moors, who composed the greater part of its population, were finally expelled from Spain in 1609, it received a blow from which it has never recovered. At the height of its splendor it is said to have contained as many as 500,000 inhabitants. Granada , New. See Colombia.